Steep Point is the westernmost point of the Australian mainland, located at 26°09'05?S 113°09'18?E. It is located within the Shark Bay World Heritage site in the Gascoyne region of Western Australia. 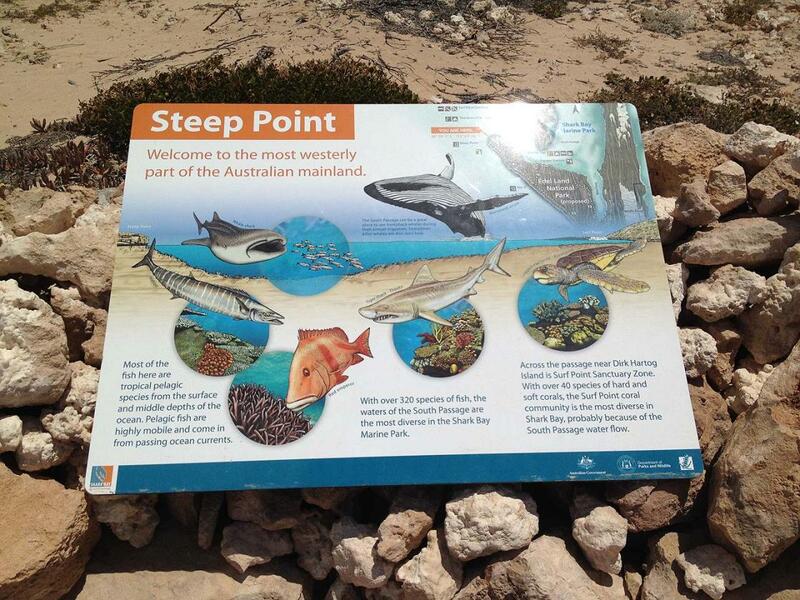 Steep Point, the most westerly point of mainland Australia, can be accessed by driving through Edel Land National Park (proposed) and this peninsular forms part of the Shark Bay World Heritage area. Steep Point is part of the amazing Zuytdorp Cliffs that are about 200 metres above the Indian Ocean and is considered one of the best land based game fishing areas in the world. We drove around to The Oven / Faultline near Steep Point and there were three camps of men who had spent several weeks fishing. To fish off the cliffs requires specialised equipment and they use a helium balloon to carry the bait out into the channel and then it bobs up and down in the water with the wind to help attract the fish. Steep Point itself is just up the road and we stopped for some photos in front of the sign just to prove that we had actually been to the most westerly point - seeing is believing. Don't forget to sign the visitors book! It can be very windy on the top of these exposed cliffs and I was not game enough to go too close to the edge. We had been told it would take us at least two and three quarter hours to travel the 105 kilometres to Steep Point from Tamala Station - hard to believe it would take this long but you have to see the road and you would understand. Only high clearance 4WD vehicles can travel along the last 30 kilometres of this very sandy track. There was quite good gravel road for the first 50 odd kilometres and then you have to let your tyre pressure down to 20 psi before tackling the sandy and very corrugated tracks heading into the park. These are only single width so you always need to be on the lookout for oncoming traffic as there are very few spots to pull off the road. The road to the Ranger Station takes you over Belefin Prong which is a series of huge sand hills - some of the summits are quite blind. After the Ranger's Station there is Shelter Bay which is a designated camping area with a couple of Eco Toilets (Eco toilet very rarely smell and these were well maintained). The camping spots are close to the beach and are sheltered from the winds - you are able to launch a boat from Shelter Bay if you wish to fish or dive in the south passage or maybe visit Dirk Hartog Island. After Shelter Bay you make a sharp turn up towards the southwest side of the point and up over some nasty rocks onto more sandy hills. There are a couple of signs along the road that warn of road hazard at particularly bad spots or blind summits. Remember you will need to take all you fuel, food and water when visiting Steep Point and bring all you rubbish back out with you - no dogs are allowed in this proposed National Park. have you been to Steep Point? Explore Steep Point - Edel Land NP with RvTrips and find out where to stay, what to do and what to see. Helping caravan, motorhome and camper owners have a great holiday.